Howard Erker via Oakland Museum of California. Gift of BANG newspapers. 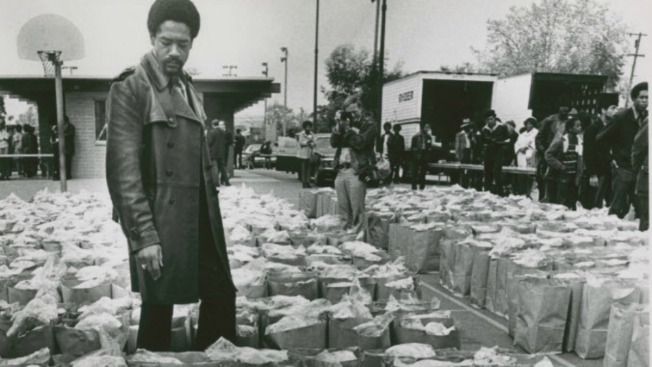 Black Panther co-founder Bobby Seale checks food bags. March 31, 1972. Bobby Seale, co-founder of the Black Panther Party, will be speaking at a Richmond event commemorating Black History Month on Feb. 24. The “Black History Month: Breakfast with Bobby Seale” event is hosted by nonprofit For Richmond and is taking place from 9 to 11 a.m at the Craneway Pavilion. Community members who are interested in attending need to RSVP online. “As the original Black Panther Party observes its 50th year anniversary, there couldn’t be a better time to welcome Mr. Seale’s return to Richmond to reflect upon his momentous social justice work and advocacy on behalf of African-American people — including in Richmond,” the organization said in a news release. Kyra Worthy, the director of the community nonprofit, said Seale jumped at the opportunity to return to his old stomping grounds. “People can expect to have a good time and to hear some encouraging words, to see their fellow like-minded community members give an uplifting message,” she said. The public breakfast will follow an early morning event for Seale and kids who live at Pullman Point affordable housing complex. There, Seale will help lead the free breakfast program For Richmond implemented back in November. It was the Black Panther Party that originally championed free breakfasts for underserved students, starting a revolutionary program in Oakland almost 50 years ago. Seale and co-founder Huey P. Newton established it after reading studies that linked eating breakfast to strong academic performance. By the end of 1969, their program was responsible for feeding 20,000 children across 19 cities. For Richmond's program at Pullman Point tries to carry on that legacy, Worthy noted. Seale regularly gives speeches and talks to young children and college students about social justice. He turns 81 on Feb. 25, the day after he is slated to speak in Richmond.